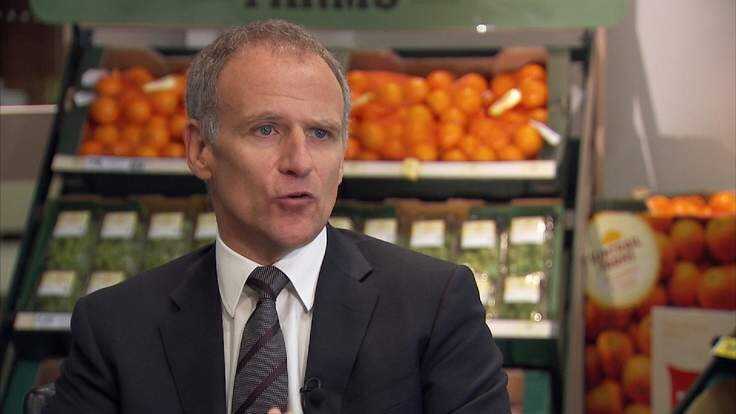 The chief executive of Tesco has been awarded an annual bonus of nearly £3m after Britain’s biggest grocer moved back into profit after notching up the biggest loss in its history a year earlier. Sky News has learnt that Tesco will disclose in its annual report – to be published on Friday – that Dave Lewis was handed a cash-and-shares bonus close to the maximum potential payout of £3.15m. The award to its chief executive will be announced alongside a £185m bonus pot to be shared out among the company’s 265,000 UK employees – equating to 5% of each worker’s annual salary. Sources said that Mr Lewis had been determined to fulfil a commitment he made in April to reward employees for delivering the beginning of a desperately needed turnaround. The company – once a dominant force in British business – has endured a torrid few years, culminating in a £6.4bn loss in 2014, one of the biggest in UK corporate history. A Serious Fraud Office inquiry into a vast overstatement of profits, launched soon after the departure of Mr Lewis’s predecessor, Philip Clarke, remains ongoing. Mr Lewis, a former Unilever executive, has begun to improve Tesco’s performance, with the group showing a return to like-for-like sales growth in the fourth quarter of last year. A source said on Wednesday that “the foundations had been laid” for a sustainable turnaround of the business, with net debt slashed by 40% after the sale of its operations in South Korea, improved cashflows and increased sales volumes. The supermarket group’s long-term share plans have failed to pay out for several years because of the company’s weak performance, and City investors are said to be keen for Mr Lewis to be adequately incentivised to see the job through. The Tesco chief earns a salary of £1.25m and can earn a maximum annual bonus worth 250% of that sum. His bonus will therefore put him in line for a package for 2015 worth well over £4m. Although Tesco is unlikely to face an investor revolt of the kind seen at many blue-chip companies’ annual meetings this year, some shareholders may be surprised at the size of his bonus given that Tesco shares have fallen by a third during the last 12 months. Mr Lewis has embarked upon a clearout of loss-making businesses, including Dobbies Garden Centres, Giraffe and Harris & Hoole, with Euphorium, a bakery business, set to be closed. The move comes as part of a decision by Mr Lewis and senior colleagues to sell a string of under-performing or non-core businesses bought during an ill-fated acquisition spree over the last decade. Many of the smaller businesses were bought by Mr Clarke, who had ambitions to diversify the retailer’s appeal to customers and find ways of utilising excess space in its stores. Mr Lewis now wants to offload businesses and brands which either dilute Tesco’s margins or act as a distraction from its principal revival mission. Mr Clarke’s tenure ended in 2014 when he was sacked after a string of profit warnings. The beginnings of a turnaround in Tesco’s performance comes amid continuing competition with discounters Aldi and Lidl, and its more traditional rivals J Sainsbury, Wm Morrison and the struggling Asda. Posted on May 13, 2016, in #retail, #uk, Other. Bookmark the permalink. Leave a comment.